Robert "Bob" Crompton (26 September 1879 – 16 March 1941) was an English professional footballer. He spent the entirety of his career with his hometown club, Blackburn Rovers. He also represented England on 41 occasions, captaining them 22 times. Born in Blackburn, Crompton spent his entire career at full-back for Blackburn Rovers, playing 528 games between 1896 and 1920. 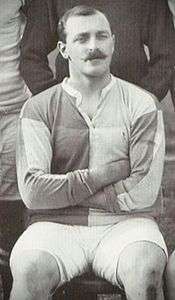 He won the league twice as captain of the team in 1912 and 1914. In the 1915–16 season he played for Blackpool in the regional leagues set up by the Football League during World War I where he was made club captain. His 41 England caps were a record until surpassed by Billy Wright in 1952. He began his career as a centre-half, but it was at full-back that he excelled, Charlie Buchan describing him as "...the outstanding full-back of his time. A commanding personality, he was the best kicker of a ball I ever ran across." He later went on to manage Blackburn between 1926 and 1930, leading them to the FA Cup victory over Huddersfield Town in 1928. After a spell managing Bournemouth, Crompton returned to Rovers as manager in the late 1930s to guide them to the Second Division championship. Crompton had a heart attack in 1941 while watching Blackburn play Burnley, while he was still in charge of Blackburn. His team had just won the match 3–2. He died that evening. Crompton was in partnership with his Blackburn Rovers team-mate, the Welsh international centre-forward William Davies, as motor engineers. It was announced on 25 February via Twitter that Bob Crompton would be inducted to the Hall of Fame by the National Football Museum as a 'Historic Player'. ↑ Wolstenholme, Gerry (May 2008). The Khaki Years, Blackpool Football Club The World War I Seasons 1915/16 - 1918/19. Blackpool: Blackpool Programme and Memorabilia Collectors Club. pp. 1–5. ↑ "England's Most Successful Captains". Daily Telegraph. February 2012. ↑ "Archived copy". Archived from the original on 25 October 2011. Retrieved 2011-04-18. ↑ Davies, Gareth; Garland, Ian (1991). Who's Who of Welsh International Soccer Players. Bridge Books. ISBN 1-872424-11-2.